I’ve had the joy of having a new kitten three different times in my life. One was a male, and two were female. Each one was so adorable in their own way. Each had their own distinct personality, their own little cute habits. I had one for 9 years, one for 14 years, and the last for 20 (yes!) years. All three brought me unlimited amounts of joy and love. So congratulations! I’m so happy for you that you’re getting a new kitten. I hope he or she brings you years and years of joy. What Does a New Kitten Need? Here are some essentials you’ll need to help you take care of your new little sweetie. Of course, you’ll need food and water dishes. 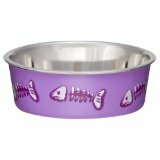 You can purchase these cute fish dishes here. Most cats are pretty good at cleaning themselves, but you should still brush them regularly. Not only will it help keep their coat clean, reduce hairballs, and reduce shedding (by a ton), but it’s also a very loving bonding experience for the two of you! Kittens love to scratch, and it’s a habit they usually carry with them their whole lives. 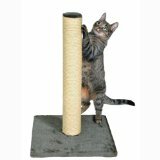 To keep your furniture safe from your kitten’s sharp nails, it’s best to provide him with his own scratching post. He’ll get years of enjoyment out of it. Even if you have an indoor cat, they should still have a collar with an ID tag in case they get out. And of course, cats who goes outside should always be wearing ID. You can purchase an inexpensive collar, then purchase a pet ID tag that has the cat’s name and phone number on it. Please don’t skip this step. Honestly, if you ever lost your cat you’d be devastated! I had a friend once whose cat carrier broke at the vet’s office. Her tomcat fell from the carrier, took off down the sidewalk, and she never saw him again. I helped her search for weeks and we cried buckets of tears. If the cat had been wearing a collar with an ID tag, he could’ve been returned to her! Of course, your kitten will need a litter box and litter. I started my first kitten using an aluminum pie tin with a handful of litter in it. All she did at first was play in it! But every day I kept placing her in it, and eventually she got the idea. My husband and I clapped and cheered like dorks when our baby went pee pee in the litter for the first time – HA! You should put the litter box in a quiet place where your kitten can easily get to it. Most cats don’t like a dirty litter box, so make sure you clean it often. I used to keep a plastic bag and scoop next to the litter box. I’d scoop it every day, then throw out the bag at the end of the week, along with the litter, then replace with fresh litter. This worked well for me. My sister always said my house never smelled like cat litter – people usually didn’t even know I had a cat! 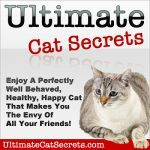 I also strongly recommend you read my article, How to Get Your Cat to Use the Litter Box so you’ll know from the beginning how to do litter box training correctly. I used the “looks like a potted plant” litter box you see in the picture. You can purchase one here. You can also see a nice variety of inexpensive litter boxes here. The picture on the right is of my little Miss Abigail the day I brought her home. I could cry just looking at this – she was SO SO SO sweet! Look at her little tail hooked up over the edge of the bed…it’s just too cute. Anyway, kittens have tons of energy, but they also need to rest. You should provide your kitten with a safe, soft, quiet place to rest. You might put a towel over the bed so you can wash the towel often (the bed will wear down too quickly if you’re always putting it in the washing machine). You can see a nice selection of cat beds here. For the first year, high-quality kitten food is the best choice for your growing kitty. 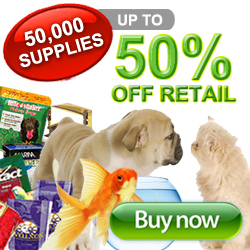 In my opinion, the rule for which pet food to buy is get the best quality you can afford. Also, it’s crucial for you to know that MOIST FOOD is better for cats. 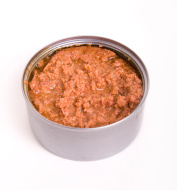 You can read about this in depth in my article, What is the Best Food for Cats? Cats who live on dry food often end up with kidney problems. Sadly, one of my cats had this. For the last six months of her life I was giving her fluids through an IV. I so wish I had known that moist food was crucial for her health. You can give your cat dry food, but make sure he also has a daily serving of moist food. My opinion is roughly 75% moist food, 25% dry. Also, be careful about treats. The treats that are soft can sometimes contain ingredients that can actually be toxic for your cat. I think the best treats are either just pieces of their dry food, or whole, real foods like little pieces of fish or chicken you keep in the fridge. Here’s a video from one of my favorite veterinarians, explaining the differences in pet foods and how to know which ones to buy. Your kitten will need vaccinations and should be neutered or spayed before they turn six months old. It’s smart to choose a veterinarian right away because he can tell you what your kitten needs and when, and also be available and familiar with you, should your kitten have any sort of emergency. 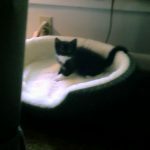 If you need help paying for medical care for your kitten, read my article, Get Help With Vet Bills. Indoor Cat Health – What Vaccinations Do They Need? I mean it – listen to me on this one! 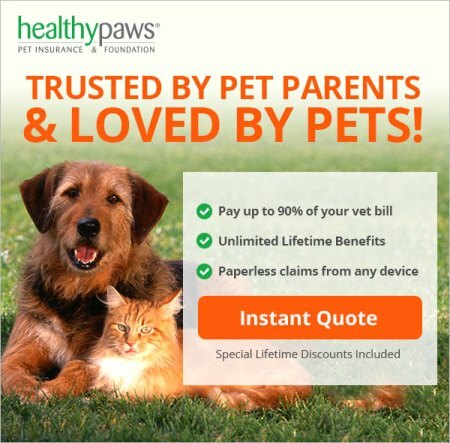 I have spent thousands and thousands of dollars over the last 35 years on medical expenses for my pets. For the first 15 years or so of pet ownership as an adult, I rarely had any more than the regular vet visits for shots, etc. I had a miniature dachshund named Maggie who had a minor foot sprain once and that was about it. Then later, one of my cats had a bladder stone and the surgery was $700. My tomcat suddenly became ill and his bloodwork showed anemia and kidney failure. He passed away, and to this day I don’t know what the cause of the illness was. 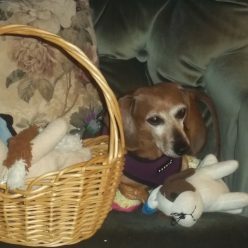 Then I got a second mini doxy named Taz and holy cow – her medical bills were out of this world! She had three dental surgeries, two back injuries, x-rays, steroid shots for collapsed bronchial tubes due to severe allergies. Then the poor baby was diagnosed with Cushings Disease. The blood work you have to do for that takes place minimally once a year and costs between $175 and $350. And the medicine costs between $75 and $90 per month. I had Taz six and a half years and spent more than $20,000 on her medical issues. During that time, my cat, Miss Abigail developed fatty liver disease and passed away – the ordeal cost me $2900. Shortly after, my last remaining cat developed serious kidney disease. See what I mean? For most of my adult life my pets just didn’t cost that much vet-wise. But then things happened. One after the other. And I was nearly wiped out financially. GOD HOW I WISH I HAD GOTTEN PET INSURANCE FOR EACH ONE OF THEM! It would’ve saved me thousands of dollars. I’ll never, ever make that mistake again. 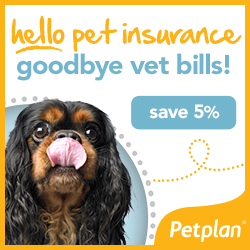 Get pet health insurance! For more information about this, please read my article, Is Pet Insurance Worth it for Cats? 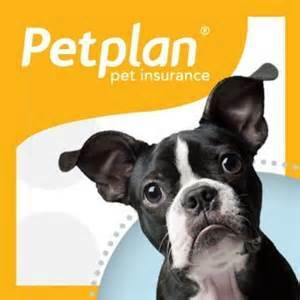 You can read my review of PetPlan Pet Health Insurance here. Policies start at $10 per month, and this is the largest provider of pet health insurance in the world. The best way for you and your new kitten to have a long, happy, PEACEFUL life together, is for you to get the knowledge you need about cat training right from the beginning. Here is a cat training program I can highly recommend. You can read my review of them here. 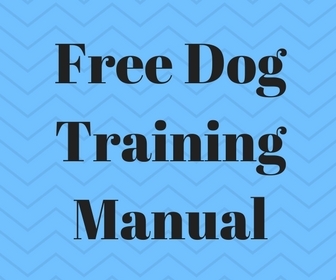 This is a step-by-step cat training program that contains 12 sections. It’s audio – you can listen to it right on your computer (you can also get a free transcript if you’d rather read than listen). It covers a large number of cat ownership issues – everything from health, nutrition, grooming, training – to dealing with cat behavioral issues. It truly is the best way to have a well behaved, happy, healthy cat! And the best part is that it comes with a 100% money back guarantee AND YOU GET TO KEEP THE PROGRAM. Previous Previous post: Removing Pet Urine Stains Carpet – Fast, Easy and CHEAP!